The team are delighted with the new images for the Major Restoration Project taking place at Blenheim Palace at the moment. 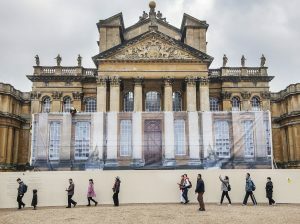 Blenheim Palace has embarked on a major £350,000 restoration project on its historic North Steps entrance. The steps, which are an integral part of the Oxfordshire baroque Palace, have been welcoming millions of visitors for almost three centuries. Recent survey work showed the stone steps are slowly spreading apart and moving downhill away from the main structure. Exploratory excavations revealed they were originally constructed on top of a mix of compacted stone rubble, earth and mortared brickwork. Over the centuries lime mortar between the bricks has been eroded and the infill base settled, this combined with gravity has resulted in the steps moving away from the Palace. A team of specialist stonemasons will painstakingly remove the existing step and Portland flagstones, before reinstating the underlying substrate. Each step and flagstone will then be thoroughly inspected to see it if requires and repairs and, if necessary, replacement. 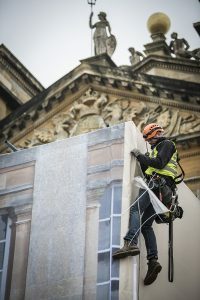 While work is taking place the area has been wrapped in a 56 metre long and seven metre high banner featuring a photographic representation of the North Steps. Special viewingwindows and platforms have also been created so the public can see the restoration work taking place. The restoration project began in December, 2016 and is anticipated to be completed by mid-May, 2017. While work is taking place the steps will be out of action to visitors, however special viewing windows and platforms have been created so the public can see the restoration work taking place. Roger File Property Director said: “We’d like to apologise to our visitors for any inconvenience this restoration project will cause, however it is crucial we undertake this type of conservation work to help preserve and protect Blenheim Palace for future generations to enjoy and experience. “The work will also provide a fascinating opportunity to gain an insight in to how the original builders created part of this extraordinary structure,” He added. Built in the early 18th century as a monument to celebrate Britain’s victory over theFrench in the War of the Spanish Succession, the Palace is the ancestral home of the Dukes of Marlborough and the birthplace of Sir Winston Churchill.